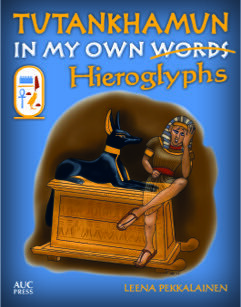 “We should write about Egyptian gods,” I distracted Mummific, who was looking at what I was doing with his mouth open in surprise. I wasn't overly keen on watching his teeth which could have used a lengthy visit to a dentist, while he was alive. I never expected such a reaction when I took a glass out of the cupboard and ran some tap water into it. Mummific, who happened to be in the kitchen with me, almost fell to his hinies out of sheer surprise. The feats of engineering were too broad a sucbect to handle, so I just commented it was a secret of engineers and you would have to study a long time to learn about it. I drank the water and he looked at me with great interest. That should have warned me, but no. I set the glass on the table, and went to open my computer so we could write about the gods. Only after a short while I realized the tap was running again. And then Ta-Miu appeared and wrapped around my ankles, trying to get my attention. It didn’t have much of a voice left after being mummified, but managed a raspy howl that alarmed me something was amiss. Have you ever dried an ancient mummy with a hair dryer? I suppose not. At least I never had. 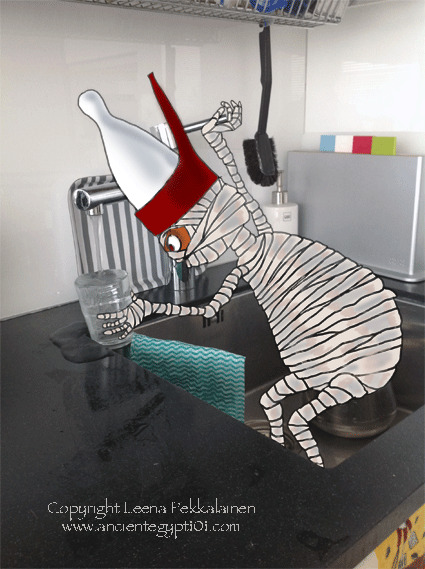 Mummific had taken the glass, opened the tap to full force, and managed to fill the glass and the whole kitchen with water in the process. Then he got the idea of tasting what our water was like. I don’t know what they drink or eat in the afterlife, but our water certainly made him wet inside and out. When I reached the kitchen, water was trickling from between his bandages (that is from the inside out) and he was dripping water on the carpet. I swear he had shrunk out of sheer embarrassment. Ever dried a mummy with a hair dryer? He looked at his messy bandages when I think I finally had him all dry, and I swear his dry lower lip was trembling. “Yes, this means your Mrs. will re-wrap you for sure,” I announced. "Gods help me..." he sighed. "Talking of which. Could you tell me about your gods as well?" "But of course, would you like us to write about all of them now? That might take a few weeks, but I don't mind!" Mummific looked at me eagerly. He was clearly clutching straws here. There must be.. over a hundred gods in Egypt. Someone was trying to avoid re-wrapping... Which he could not avoid, eventually. 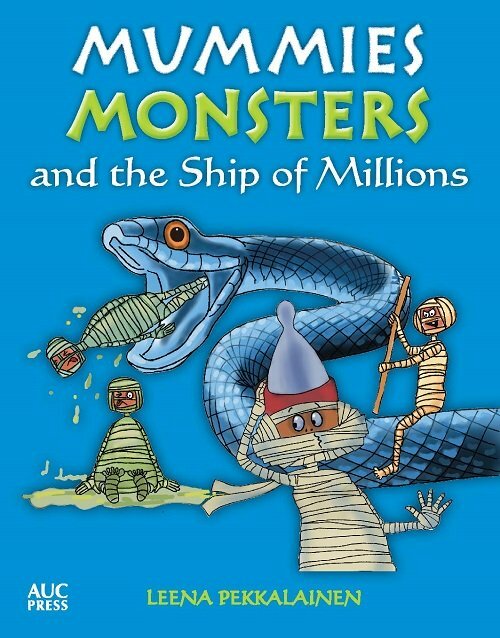 But once he had stopped carrying a grudge on me for not sitting and writing down all his rather amazing stories of the Egyptian gods at one sitting, we did go through the gods eventually. 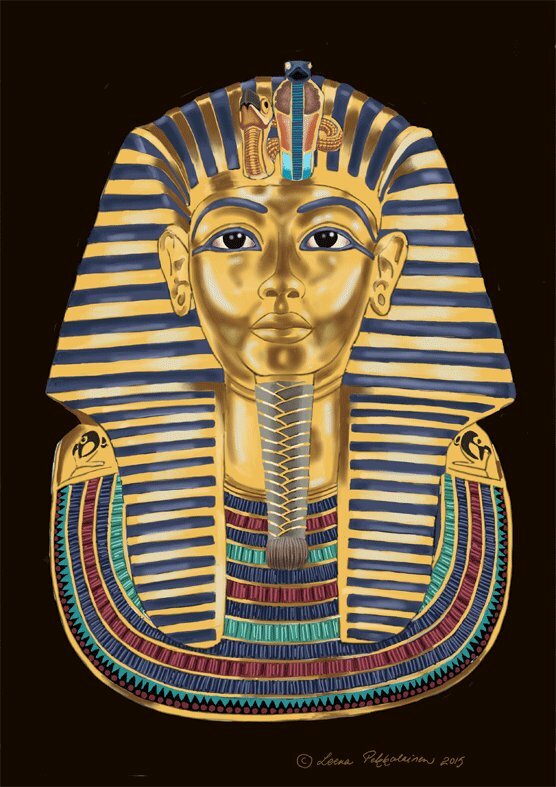 You may read the Mummific and fact versions of the gods below. Don't believe all he says in his stories - I have a strong suspicion he is quite a story teller, and good stories are always exaggerated. So if you are after facts, do choose the fact-version... 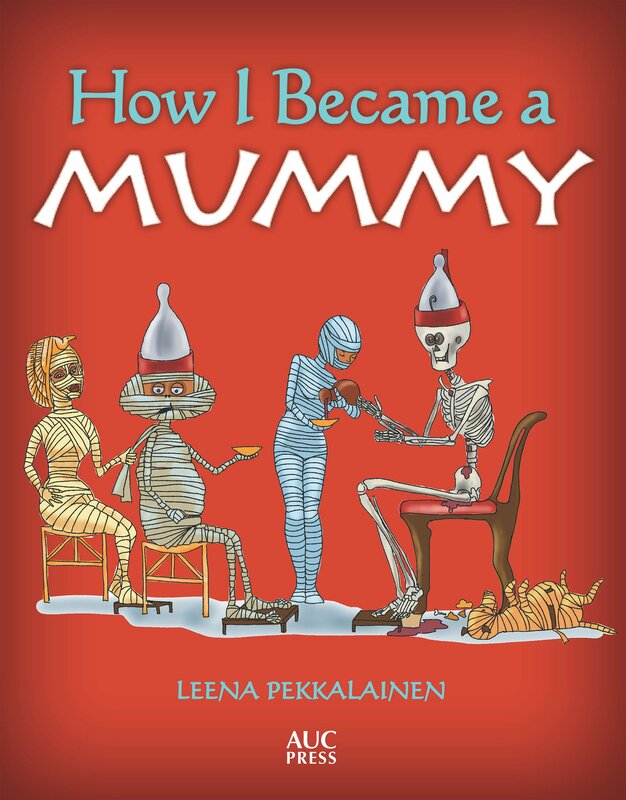 I take no resposibility of the Mummific version. 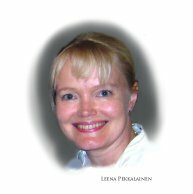 Thank you, Heidi Kontkanen, once again, for your photo and the permission to use it on this website.